at one of my watering dishes. I quickly grabbed my camera, no time for correct settings, and snapped away. which I have never seen in my backyard before. Or for that matter, anywhere else! They are dependent on spruce cones, wandering widely in search of them. Their primary habitat appears to be Canada and northern U.S.
and breed at any month of the year. This group looked like it had a few youngsters among them. The photo below by Steve Berliner is a better view of their unique bill. but they were mighty thirsty! I have seen visit my backyard so far. I'm curious as to what's been the most unusual bird visitor for you? I always find it such a treat to see a new visitor in our backyard! This one is quite unique looking and that beak looks like it doesn't line up! so cool to see them! i find their pine-cone-breaking-bills so unique. my most unusual visitor has to be a wood stork that spent a few days hanging around a couple of winters ago. prehistoric looking thing! Wow, gorgeous shots, I've never seen this bird before. We have all sorts of birds, but none of this kind. I think the most unusual one to visit has to be the scarlet tanager. I've only seen it once and I didn't have my camera with me. Oh, you lucky girl!!!! Now run to Anna Maria so you can see the razorbills, too!! I've never seen a crossbill but knew immediately what it was thanks to that distinctive beak. Keep your eyes open. There might be other wanderers dropping by. I think the most unique birds I've seen in my back yard were Pileated Woodpeckers -- 3 at one time, if you can believe it. I suspect a family. The one and only time I've seen them here, although they are native to the area. What beautiful birds and so different!! I've never seen one before! In fact I've never seen such a small bird with such a crooked beak!! Terrific captures, Reena! Thanks for sharing!! Have a lovely week! I've only seen Crossbills in photos in books ... what a treat that you saw such a large group of them in person ... AND take photos! One fall afternoon about 20 years ago, I looked out my back window and saw at least two dozen Eastern Bluebirds. They were hanging out, taking turns bathing in the sprinkler puddles in the yard. Never seen so many at the same time since then. These are beauties, there has been some unusual sightings of Grosbeaks and Crossbill in the lower states this winter something to do with a lack of there natural foods in the Canadian border area...I think for these it is cones but there are some including myself would die to see them ; )!! What serendipity, Reena, and that beak surely is unusual. Beautiful bird! Reena, I love your White-winged Crossbills. They seem to be showing up all over the place lately. 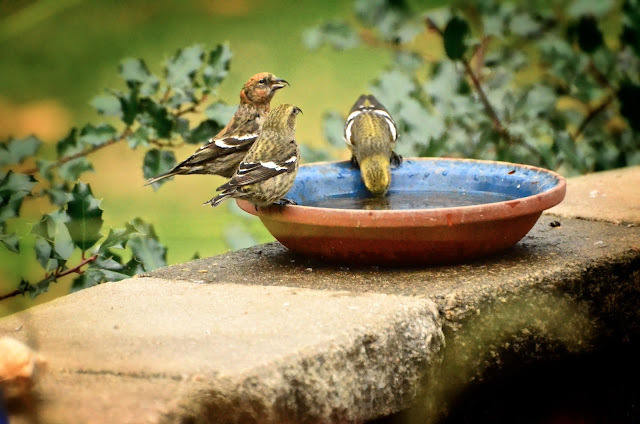 I have not had them in my yard but it would make me extremely happy to see them at my birdbath. Lucky you! Awesome photos! Wonderful to see them from your office window Reena ....such sweet little birds. At the moment my fruit trees are fruiting and consequently I have many colourful parrots sitting in among the foliage munching away. We have Crossbills at altitude but I believe a different type - yours are so colorful. It looks so green there! What a pleasant surprise! They're beautiful little birds. I'm terrible at identifying birds, but I'm getting a little better of late. A Carolina Wren is about my most exotic. Hi Reena! This is when it pays to be paying attention and have that camera ready--What a fun sighting of an interesting bird I've not heard of before! We have a lot of the usual birds here in our little corner of Virginia, but the owls are the ones I really love seeing. I have never heard of this bird before. They are so colorful and have such unusual beaks. I wonder if it serves a purpose of some sort. The most surprising bird I've ever seen in my yard was an indigo bunting in Texas. He visited for 2 days and we never saw him again. What a group of cutie pies. Their beaks are so unusual, I must Google them and read about the purpose. How fun to see a new bird. Those beaks do look so unique. Thanks so much for sharing them with us. I have a flock of Evening Grosbeaks at my feeders once or twice a week....a good-sized flock! 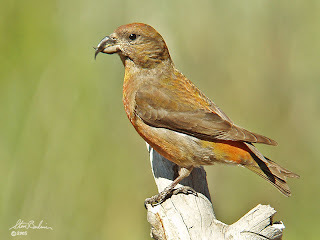 The most unusual bird to visit my feeders this past year was the Red Crossbill, generally seen only in the wilderness. There was a pair...and this was the occasion when a hawk swooped down and carried one away! That's a very cool looking bird. I'm glad you were there to capture them and I hope they return again. These are some really fantastic shots! It really is the bill that I find so unique in this bird! So beautiful pictures, they look like some fantasy book illustration. What a unique bill they have! Kudos on this capture. They have a lunch meeting. What a crazy looking bill they have, bizarre. I've noticed mockingbirds here in Ohio which I never saw in CT or VA.
Beautiful! I thought I saw a Peregrine Falcon once. Not 100% sure but it looked like one. Oh you lucky thing, what sweet little birds. Birdbaths are the best things to have in a garden, a necessity in mine, but even the Lorikeets are a bit bigger than these little beauties. Great photos as usual. My bird feeder is actually now, a squirrel feeder. 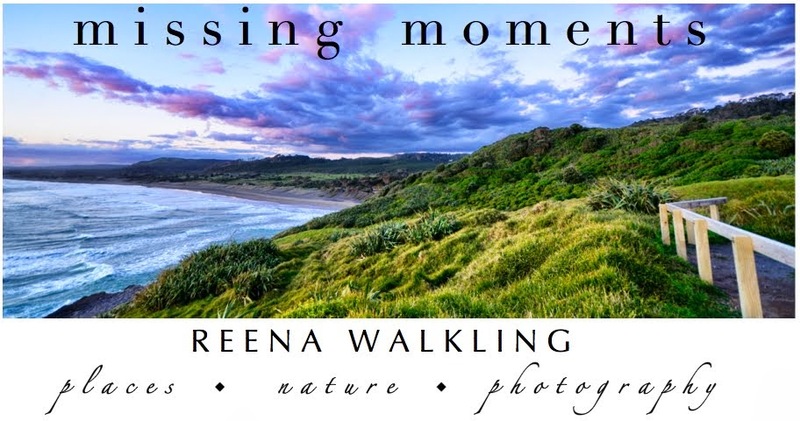 What lovely captures, Reena. I love that one of the birds is so colorful with its red/pink wings. Sometimes we just have to stop what we're ding to catch the memory. Nice job! Ah - such gorgeous visitors! Love the seals in the post below too. word is out that Reena serves good seed ..
What a find, Reena! My most unusual bird, which to most wouldn't be so unusual, but I had never seen one visit before - is the Northern Flicker, yellow-shafted form. Beautiful! 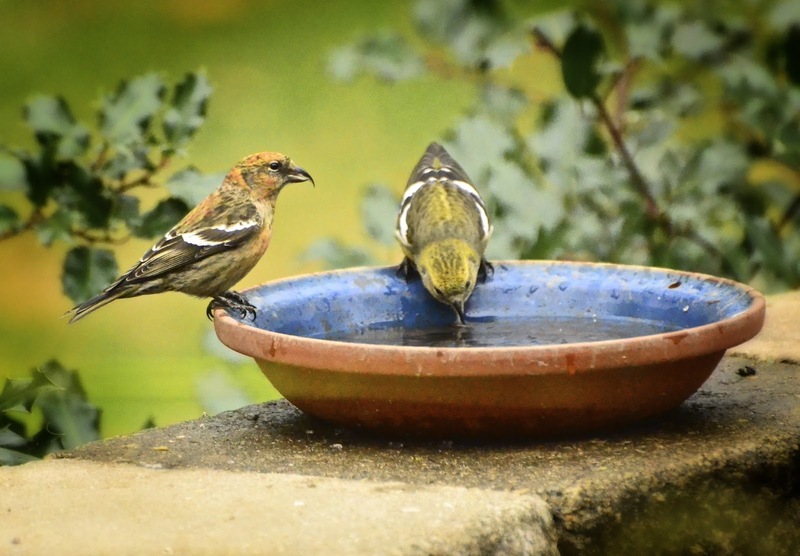 Geat to see your crossbills. I have, of course, admired them in books but never had the chance to see one myself. Great that you managed to snap them. Reena what a priceless picture of your new visitor. Thank goodness you were at your desk w your camera handy. Cedar Wax Wings stop. 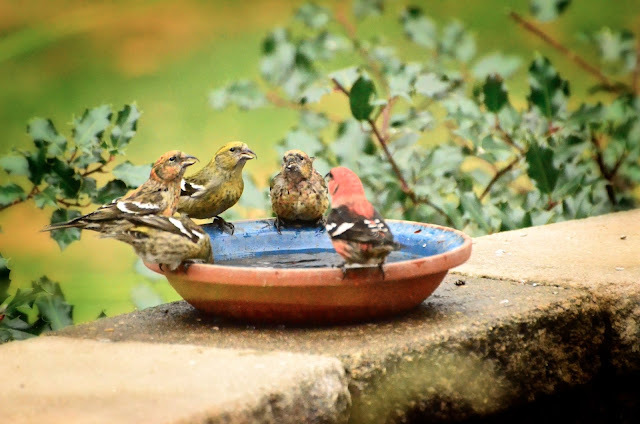 They travel in flocks which is amazing to see them all in a tree or gathered around the bird bath. I do love your watering dishes...are they heated? and where did you get it if you don't mind me asking? what a meeting they're having!! always beauty around you, dear reena! very beautiful looking little bird. love your shots. always delightful!! They almost look uncomfortable the way they cross. One time three sandhill cranes walked through the backyard. How I wished they would have stopped long enough to get a picture. What a great surprise! I think the biggest treat for me was the scarlet tanager. I had been waiting my whole life to see one in "person"!